Am I entitled to Microsoft office 2013? As a registered student you are entitled to 5 copies of Microsoft office 2013 for you devices. How do I obtain my free copy of Microsoft Office 365 Pro Plus? - At the top right of the page click Settings Office 365 Settings. - Click on the “install” button. NOTE. Office installs the 32-bit version on your PC by default, even if your computer is running a 64-bit version of Windows. If you are unsure which version of Office you should install, see Which version is best for me? If you’ve already installed the latest version of Office with Office 365 on five computers that you use and you want to install Office on a sixth computer, you can do that by first deactivating an installation on one of your current computers. Go to Software > Office. Click Deactivate next to the computer you want to deactivate the installation from. When you’re installing, you may get a "Something went wrong"error. Or, if you get some other error, see General troubleshooting for installing Office 2013 and Office 365. After you have Office installed, try creating a few documents. If an Office program looks blurry, displays as all black or all white, the screen flickers, or looks different on different computers, see Office 365 doesn’t look right. You can install the latest version of Office on up to five computers that you use. After you’ve completed the installation, make sure you have automatic updates turned on. - Office on your PC includes Access, Excel, Lync, OneNote, Outlook, PowerPoint, Publisher, and Word. - Office on your Mac includes Excel, Outlook, PowerPoint, and Word. - Mac users can install Lync separately. NOTE: You can also install the latest version of Office on your Surface Pro. You’ll have all the same programs as Office on a PC. How you get the latest version of Office is different from Office 2010 or Office 2007. The latest version of Office with Office 365 is offered as a subscription. Also the Office applications are packaged together for faster download and installation. Once you’ve installed Office, you can remove the short-cuts to the applications that you don’t need. OneNote and Lync Mobile available as separate download. See here for more options. Yes, a valid Office 365 ProPlus license tied to a valid Office 365 login for students is required to enable any of the four Office 365 ProPlus features. You must also login to your Office 365 account at least once every 30 days. The guidelines are such that they can leverage this program until they graduate or are no longer attending St. Angela�s College. At that point, we must disable their Office 365 ProPlus license. How is this different from Office 2013 Professional Plus? 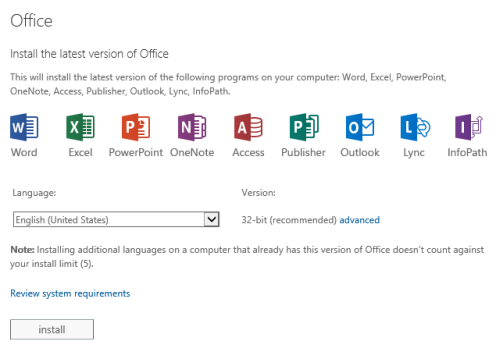 The Office 2013 applications are exactly the same however there are some differences including patching, license sign in for usage, and Click-to-run (C2R) technology for rapid installs (2 minutes for quick usage). Where can I get training on Office 365 ProPlus? There is some excellent end user training on Office 2013 here. Some end user help guides on Office Mobile for iPhone here and here. Some end user help guides on Office Mobile for Android here and here.